ScreenIn3D, a partner of AMS Bio, reports on the accolades it has received following the recent launch of its novel microfluidic cancer screening service. Combining the latest advances in microfluidics and 3D culture, the service uses an optimised screening platform targeted at improving anticancer drug treatment and accelerating development of new personalised medicine solutions. At the recent Miptec conference in Basle, Switzerland, ScreenIn3D was one of 60 global organisations invited to showcase its cutting-edge life science technologies for research, science and innovation. 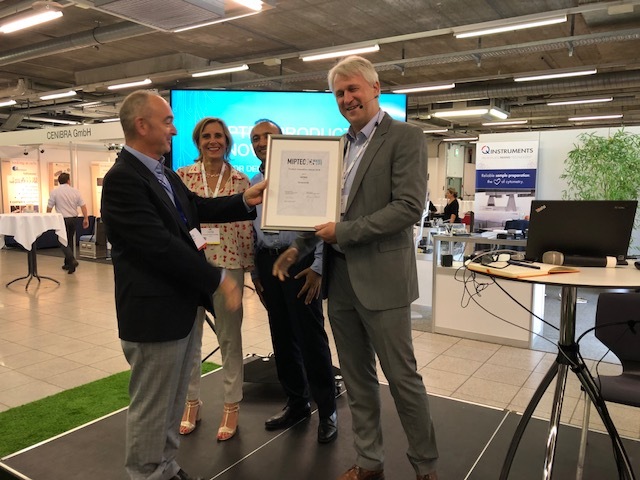 After two judging sessions, with five different drug discovery technology experts, the Product Innovation award was presented to ScreenIn3D for its cancer drug screening service. At the forthcoming ELRIG Drug Discovery meeting in London, UK the organisers have invited ScreenIn3D to participate at the event as part of their Innovation Zone. The Innovation Zone gives up-and-coming companies, with exciting new technologies or services, subsidised access to a major event and critical exposure to the market. Dr Michele Zagnoni, Chief Scientific Officer of ScreenIn3D said: "We are delighted to have received these prestigious accolades from leading drug discovery experts." He added, "the widespread interest in our cancer drug screening service is evident in that we have also been invited to talk at two further events - the '3D Structures & Bioprinting for Drug Discovery and Beyond' meeting in Glasgow and the 'Advances in Cell and Tissue Culture conference' in Cambridge ".